It’s late spring, your site is overdue for a makeover, and you don’t know where to start. Sound familiar? Creating a new custom header is one way to refresh your site’s look and inject a fresh spark of personality at the same time. 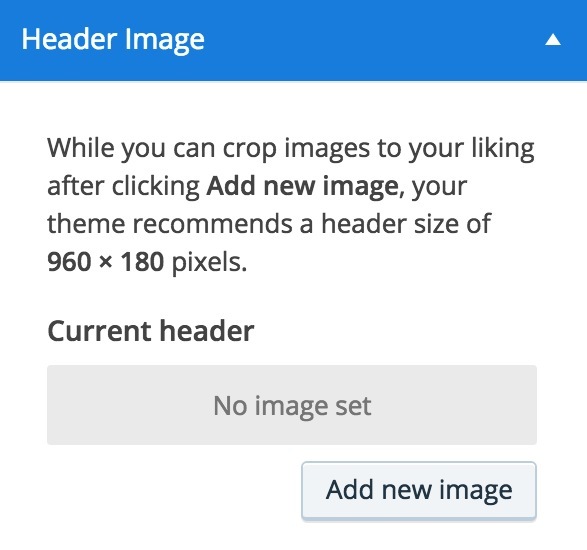 We’ve explored Pablo and Canva, two free tools to create custom images to use in image widgets and site headers, and to unify your brand across your social profiles. Today, we’ll go deeper and learn how to create a custom header using Canva in under ten minutes flat. Are you ready? Here we go! Heather Armstrong, who blogs at Dooce, changes her header once per month. Here’s her archive of often hilarious mastheads. Note: you can also find key specs and dimensions for your theme at the bottom of its showcase page. Next, create an account with Canva. For a quick peek around, browse various tutorials or resources like color palettes, font combinations, and even design courses. Otherwise, let’s dive right in. Canva offers plenty of free images to choose from, and you can also upload your own. Here’s a resource of high-quality, free-to-use stock photographs. Canva has free design tutorials on design elements such as fonts, color, images, backgrounds, shapes, and more. This resource scratches the surface of the custom headers you can create with Canva. Now get on over there and start experimenting. Have fun! We tried creating our blog header too! But we used “Paint” because that’s all we knew! 😛 This seems awesome, will use it when we need an upgrade! I love headers and change them pretty often. But I do like them wordless – in my opinion, the images should be clear enough to serve as an intro, so the text in my blog post jumps out. Perfect timing for this post – thanks so kindly! I would like a certain pic in my header but due to the # of characters in my site title, it was pushing the bottom of the title slightly below the pic so it looked off. I think the tips in this article will allow me to put together both the title and the pic in one nice & clean shot. Thanks again. This seems like a great way to customize and further brand your blog! Thanks for sharing. Thanks for sharing I always wondered how you graphic ninja’s did this stuff! I just changed my header with Canva on Monday! It was super easy and I loved it. I already used it to make a blog image for my latest post. Good job! It looks great. I just checked it out! Creative and clever. Love your profile photo too. It is cute and happy! I always wondered how that was done. Thanks for the great tip. I will try and play around with it. It certainly can make some posts “pop”! I’m so happy you guys have caught on to Canva! They are the best free/semi-free tool I found to use on the internet last year. I mention this website to everyone I know in graphic design. I even mentioned them in a post in January. I spend a lot of time creating designs on that site. They are fantastic! They do sound cool, when did you start using Canva on your blog? Sometime last year. I’ve recently changed my blog theme so the header I created is no longer being used. What I like most is that you can upload your own pictures and create new graphics. There are so many text fonts too. You can get really carried away once you start using it. Thanks! I sounds interesting, I have never heard of a canva before until today. This is awesome, thanks for the tips on how to make a greater blog. Thanks for this. I now have a personalized header. I just started blogging and canva is my go to program. Thanks for the details on a custom header! Been using Canva a lot recently. Love it!